WIPI Distinguished Photographer Award, established in 1983 honors women photographers who have contributed substantially to the world of photography. Now 101 years old, Editta Sherman known as The Duchess of Carnegie Hall was born in Philadelphia, PA on July 9, 1912. As a young girl, Editta was introduced to photography by her father, a professional photographer with studios in Patterson, New Jersey. In the mid 1940's, married and working as a portrait photographer, she moved with her husband Harold and their five children to New York City. The year 1950 would set the stage for Editta to embrace portraiture in a way that very few have the opportunity to achieve. Her professional portrait business was now located in Studio 1208 on the top floor of Carnegie Hall, known as the Skylight Studios, the building and surrounding area a breeding ground for the arts. The next unforeseen change would be the 1954 loss of her husband and partner, Harold, leaving Editta to raise five children as a single mom and working photographer. According to Sherman "Remember it is not the camera, but the person behind the camera that makes the difference!" Using her father’s 8x10 Kodak camera and her own classic black and white style lighting to capture the genuine qualities of each subject, Editta photographed writers, poets, models, theatrical greats, and musicians. These included legendary artists Tyrone Power (one of her favorites), Noel Coward, Henry Fonda, Carl Sandburg, Marcel Marceau, Leonard Bernstein, Maurice Chevalier, Angela Lansbury, Julie Harris, Jessica Tandy, Yul Brynner, Bela Lugosi, Joe DiMaggio, Robert Evans, Susan Strasberg, LeRoy Neiman, and others such as Andy Warhol, Frank Stella, Veruschka and Tilda Swinton. Sherman’s portraits have been both featured and commissioned by GAVERT company for the 1947 Chicago PAA convention showcasing their Gevalux Velour paper. Her one woman show, Men of Achievement was shot on 8x10 Ektachrome for Radio City’s first exhibition of Photography on Parade and in 1967, Kodak presented Editta’s largest one-woman public exhibit in New York’s Grand Central Station's mezzanine. Because of her flamboyance and artistic nature, she was asked by Andy Warhol to appear in his 1985 film The Dectetive and Abel Ferrara's cult film Ms. 45. As a model, the costumed Editta posed for friend and neighbor NY Times Photographer Bill Cunningham in front of 128 Manhattan significant architectural buildings for his book, Facades. Editta, a 60 year resident of Carnegie Hall, is the poster image of the Lost Bohemia, the 2010 film about Carnegie Hall produced and directed by fine art photographer Josef Astor, a fellow Carnegie Hall tenant for over 20 years. The documentary is an intimate portrait of the devoured historical wonderland. "Women In Photography International is honored to present our 2013 Distinguished Photographer’s Award to Editta Sherman, a woman who, at age 101, can be an inspiration to all women pursuing a career in photography" says Jean Ferro, photo artist and president of WIPI. 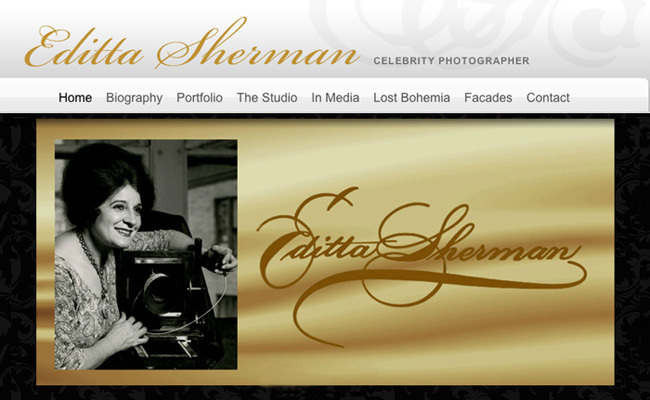 "Editta Sherman is a true artist who remains engaged in life, love of people, career and her family." Sherman’s dedication to creating classic portraiture is a testament to the way she lives each day, with a double dose of “Joie de vivre” – a cheerful enjoyment of life and an exultation of spirit!